Flame Tree Press, 9781787580534, 288pp. Early one fine autumnal morning in 2001, an old man is found asleep on Hampstead Heath. Abruptly awoken by two dog patrollers, a struggle ensues resulting in the oddly-dressed character being arrested facing a minor assault charge. Rookie barrister, George Winsome, is tasked with defending the old boy who believes himself to be the mythical character, Merlin. When the victim of the assault unexpectedly dies the resulting manslaughter case turns into a jury trial catching the public's imagination. George decides to defend Merlin on the basis that there are well-established historical grounds for the old boy's self-adopted identity believing the jury will decide whether he is 'Merlin' or not, does not matter; it's a question of the old boy being accepted an honest and peaceful character. That's the plan. But as the riotous trial plays out, events conspire to challenge everyone's cynicism. What if the defendant really is Merlin? The trial progresses through one unexpected twist to another and those present in the courtroom and the wider public begin to embrace the extra-ordinary possibility that Merlin has indeed returned to this world. Even the crusty trial judge is forced to reconsider his ingrained beliefs and confront his own domestic demons especially when his wayward, new age son decides sneakily to 'enlighten' his father with some vintage LSD. The media take an unexpected interest in this engaging and challenging character and turn the trial into a cause c l bre. In the hazy and wild events which follow the trial, George's girlfriend, Heather, discovers she is pregnant and on the same day she is cynically fired from her promising publishing job leaving Heather bitter and vengeful. Heather sees as her route to revenge the acquisition of a quickly-acquired fortune through Merlin's celebrity status, and decides to take advantage of the interest in Merlin by the Prince of Wales. But who is playing whom? As Merlin's past unfolds George and Heather become embroiled in Merlin's other-worldly friends, spirits and gods. At the time of the birth of their son, Merlin's past is unraveled, and his true identity revealed, dramatically. Both Heather and George, in their separate ways, come to understand that their collective material-based obsessions were merely illusionary and that the real source of their happiness and love has far deeper, spiritual foundations. 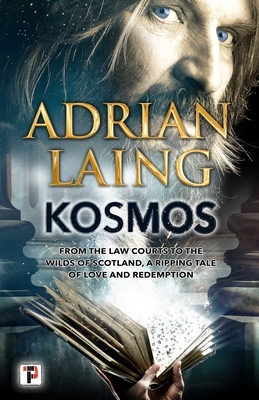 'Kosmos' is a contemporary novel of two halves; the first part culminating in Merlin being tried and freed; the second half in the outrageous events and revelation that follow, Kosmos draws on the author's experiences as a trial lawyer, his interest in complex psychologies and the rich and complex history of the mythical figure of Merlin. Kosmos is a wild, feelgood novel, a right-of-passage tale of love, redemption, revenge and hubris. FLAME TREE PRESS is the new fiction imprint of Flame Tree Publishing. Launching in 2018 the list brings together brilliant new authors and the more established; the award winners, and exciting, original voices. Adrian Laing was born in Harlow, Essex in 1958 and was educated at Hillhead High School, Glasgow and Exeter University where he studied law, graduating in 1978. Adrian was called to the bar (Inner Temple) in 1979, aged 21. Following a sabbatical in Paris studying with Michel Foucault at the College de France, Adrian undertook a pupillage in chambers and was made a Tenant (2 Pump Court, Inner Temple) practicing at the criminal bar defending and prosecuting in jury trials for seven years. Leaving the criminal bar in 1987 to pursue more commercial interests, Adrian worked as the Assistant Head of Licensing at the ITC during the Channel 3 franchise process and then as a full-time consultant to the Chief Executive of Thames Television (Richard Dunn), following which Adrian was appointed the Senior Broadcasting Lawyer for the Leeds-based firm of solicitors, Hammond Suddards working in the city of London. In 1994 Adrian was selected to become the first in-house lawyer at the Murdoch-owned publishing house, HarperCollins, where he held the position of Director of Legal Affairs and Company Secretary till 2001 working with some of the leading authors and agents of the day. Adrian qualified as a solicitor in 2003 and set up his own legal practice (Laing & Co) for over 10 years acting for a wide range of prestigious business clients and authors. Adrian presented or chaired a leading seminar for The London Book Fair 2003 to 2012. Adrian Laing is the co-author with his wife (Deborah Fosbrook) of three leading law titles published by Bloomsbury Professional, the author of R.D. Laing: A Life a widely acclaimed biography of his late father, the Scottish psychiatrist R.D. Laing, and a novel, Rehab Blues. Adrian has appeared on radio and television many times most notably the BBC documentary 'Just Another Sinner' and Saturday Live with James Runchie. Adrian now lives in Eastbourne, East Sussex.